A Myanmar monk infamous for his bilious anti-Muslim tirades has been banned from giving sermons for a year by the country's top Buddhist body, an unprecedented slapdown on a man whose hate speech has galvanised religious tensions. 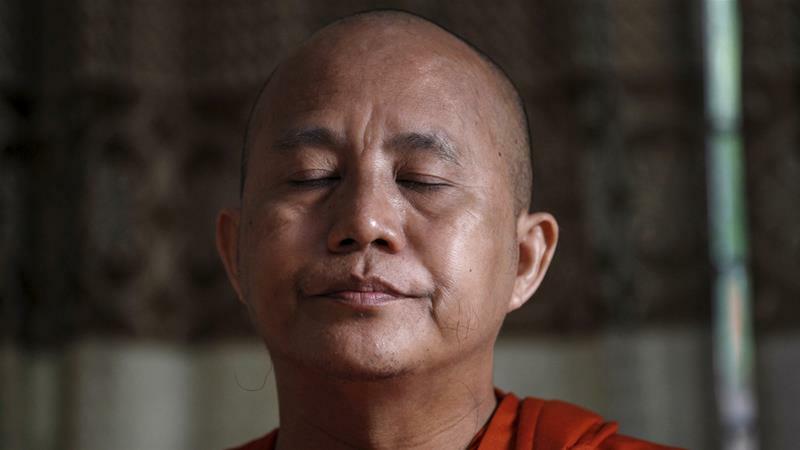 Wirathu, a monk once dubbed the "face of Buddhist terror", has led calls for restrictions on Myanmar's Muslim population, penning hyperbolic speeches warning of an Islamic takeover of the overwhelmingly Buddhist country. Myanmar is gripped by deepening religious tensions that have repeatedly spilled into violence. The unrest has been partially attributed to anti-Muslim rhetoric spread by Wirathu's wing of Buddhist monks. Aung San Suu Kyi's government is under strong international pressure to explain a bloody crackdown on the Muslim Rohingya minority in Rakhine state over recent months. The February assassination of Ko Ni, a respected and high-profile Muslim lawyer and long-time Suu Kyi ally, also heightened tensions. Wirathu, who draws large crowds to his stock-in-trade Islamophobic speeches or social media posts, had already been barred from speaking at an event shortly after Ko Ni's murder. But a special meeting of the country's most senior monks - the State Sangha Maha Nayaka - on Friday decided to ban all of his sermons. "As he has repeatedly delivered hate speech against religions to cause communal strife and hinder efforts to uphold the rule of law", the monk "was banned from delivering sermons across Myanmar for one year from March 10, 2017 to March 9, 2018", the council said in a statement that emerged on Saturday. He will face "action under the rule of law" for any breach of the order, the Sangha added, without specifying the punishment. Aung San Win, the director of the Ministry of Religion, confirmed the order to AFP news agency, but did not elaborate on the actions that may be taken against him, or say whether the order covered his vigorous social media profile. Muslims make up about 5 percent of Myanmar's population. Religious riots have roiled the country in recent years, killing scores of people - the majority of them Muslims. The worst violence has been in Rakhine, where tens of thousands of Rohingya fled a military crackdown after deadly raids on police border posts.